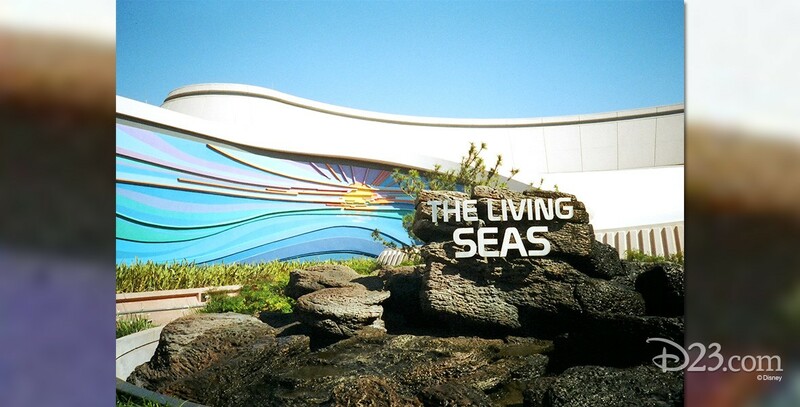 Living Seas, The Pavilion in Future World at Epcot; opening on January 15, 1986, originally sponsored by United Technologies. Exhibits on man’s search to learn the mysteries of the sea (including an actual 11-foot-long model of the Nautilus from 20,000 Leagues Under the Sea) give way to a short film on the importance of the ocean. To the accompaniment of a haunting musical backdrop composed by Russell Brower based on a theme by George Wilkins, guests descend by means of hydrolators to Seabase Alpha, where they are able to see various marine displays, look into the largest salt water tank in the world (5.7 million gallons) to view the fish and other sea creatures swimming by, and see Florida manatees up close. Divers demonstrate their equipment after completing their dives in the tank. Beginning in 2006 guests climbed aboard clam-mobiles to search for the playful clownfish in The Seas with Nemo and Friends.